Available: July 2010 Display technology: n.a. Size: 7.0" x 3.6" x 0.95"
The classroom setup uses the TI-Nspire Navigator Wireless Cradle that slides onto each TI-Nspire calculator and communicates with the teacher's computer via the TI-Nspire Navigator Access Point. Up to five wireless cradles can be charged in the TI-Nspire Cradle Charging Bay. Dismantling this TI-Nspire Navigator Wireless Cradle manufactured in January 2009 by Inventec Corporation in its Pudong Campus in Shanghai, China reveals a rather complex design with multiple printed circuit boards) PCBs. Please notice the huge Li-ION battery pack with a capacity of 1650 mAh. 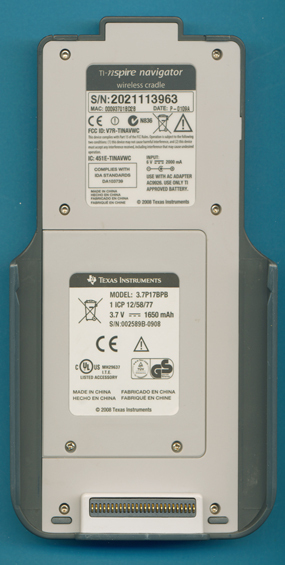 The TI-Nspire CX and TI-Nspire CX CAS calculators require the Wireless Network Adapter to communicate with the TI-Nspire Navigator System.